A U.N. investigator accused Kenyan police of widespread extrajudicial killings, and called Wednesday for the removal of the East African nation’s police commissioner and its attorney general. “Killings by the police in Kenya are systematic, widespread and carefully planned. They are committed at will and with utter impunity,” U.N. Special Rapporteur Philip Alston said in a written statement on his preliminary findings after his visit to the country. The Kenyan government said it rejected Alston’s findings. “The government finds it inconceivable that someone who has been in the country for less than ten days can purport to have conducted comprehensive and accurate research on such a serious matter, as to arrive at the recommendations he made,” government spokesman Alfred Matua said in a written statement. He said the government was concerned Alston made “such far-reaching conclusions and recommendations on the basis of his interim report,” and said the findings were released without government response. Alston said he heard “overwhelming” testimony of the killings, which he said occurred regularly. The police commissioner and other senior Kenyan police officials denied the accusations, he said. The police may kill for personal reasons, for extortion or for ransom, Alston said. He added, “Often they kill in the name of crime control, but in circumstances where they could readily make an arrest. He cited as an example James Ng’ang’a Kariuki Muiruri, 29, whom he said police shot and killed last month in the capital, Nairobi. “After a disagreement at a hotel, a police officer stopped the car James and his brother were in, and ordered James to handcuff himself. When he asked why he was being arrested, James was shot three times,” Alson said in the news release. “The only exceptional things about the case were that James was the son of a former Member of Parliament, and the incident had been witnessed,” he said. Alston said there was no accountability for the alleged police killings; there is no independent police internal affairs unit. He called for Kenyan President Mwai Kibaki to fire the police commissioner. “Any serious commitment to ending the impunity that currently reigns in relation to the widespread and systematic killings by the police should begin with the immediate dismissal of the police commissioner. In the absence of such a step it will be impossible to conclude that there is a strong commitment at the very top to deal with this problem.” As for Attorney General Amos Wako, Alston’s comments were severe, and he called for his resignation. “Mr. Wako is the embodiment in Kenya of the phenomenon of impunity.” Alston also accused government security forces of torturing and killing hundreds of men in a March 2008 crackdown on a militia in the Mt. Elgon district, in western Kenya. And he said there was compelling evidence that what he called police death squads were operating in Nairobi and Central Province with a mandate to “exterminate” suspected Mungiki gang members. “These are not ‘rogue’ squads, but police who are acting on the explicit orders of their superiors,” he said. The Mungiki militia, which are loyal to Kibaki’s Kikuyu tribe, began as a religious sect, but over the years has morphed into a gang that runs protection rackets — particularly in the slums. 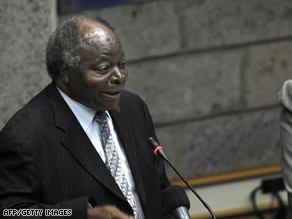 The U.N. investigator suggested Kibaki acknowledge the alleged police killings and commit to stop them. He also advocated that an independent civilian police oversight body be created, and said the prosecutor of the International Criminal Court should investigate violence after the 2007 election. He also said the government should create a witness protection program. Alston traveled to Kenya after the government invited him, staying from February 15 until Wednesday. He will issue a final report of his findings, but it was not immediately clear when it would be released.